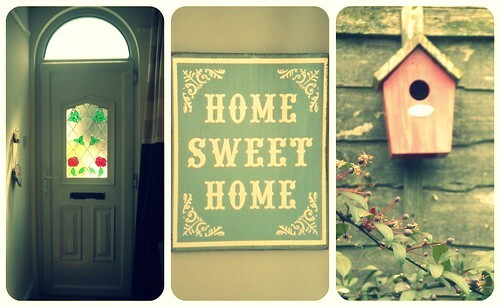 Sometimes I wake up a Miserable Homebird and wish I could move house. Usually it's something trivial that sets it all off, like the ageing boiler has packed in again and the shower is shock-treatment cold or yet another siren has whizzed past and woke Little Bird up early (spitting distance of fire AND ambulance stations.) This accumulates into seething, teeth gritting annoyance at my poor old home because I know we are stuck here, being in no position to move for a long time. The nitpicking starts: it's on a fairly busy road, the kitchen's too small, the front door opens into the living room and I WANT a hallway, there's a loft room/ 3rd bedroom with steep wooden stairs that's awkward unless you are a mountain goat (what happens if and when another Baby Bird appears) and I WANT a utility room AND a play room....the list goes on. One of my favourite pastimes is nosying at houses; driving past pretty houses (making Daddy Bird go the longer route home so I can gawp), walking around leafy streets (excellent opportunities when you have either dogs or babies) and snooping on Right Move when the family down the road have their house on the market. If you have pictures of your house on your blog I'll be ogling and if you leave your lights on in the front room as I walk past (with the dog of course) I'll be peering in. BOO! It can't just be me? I appeciate a lovely house, amaze at storage solutions and admire coordinated book shelves. However, it's very easy to feel as if you live in a bit of hovel if you think all you see online is the true picture. I feel instantly better when I see you have bit of cleaning to do to, so please include a few dust balls or rogue socks. Then, there are other days when I'm grateful for my abode as to be honest it's not that bad. Once rush hour has gone, it's fairly quiet and I can hear bird song in the garden and we have a secret passage that opens into a private road with quaint cottages with dear little gardens. The house is Victorian so the high ceilings make it feel extra spacious and I like the way that if all the doors are open from the front you can see straight through to the back of the garden where it looks like a little garden party with all my bunting strung up. Most of all it is home because my son loves it here. He's always been happier at home and in the garden than anywhere else. He runs, pushing a wooden truck from the kitchen to the front door squealing and laughing and only has to hear a jingle of keys and he's rushing to be let out into the garden where Grandad and Daddy Bird built a fence from pallets to create a contained play area. Of course, one day I would like to move, mainly to be on a quieter road so Little Bird can ride a bike safely up and down and I'm sure we eventually will. For now, I'm making the best of my space with my main purpose being creating a real fun child friendly house. I have a few projects underway to develop the now dining area into part play room too with many books and art/craft materials to hand whilst still looking organised-ish! 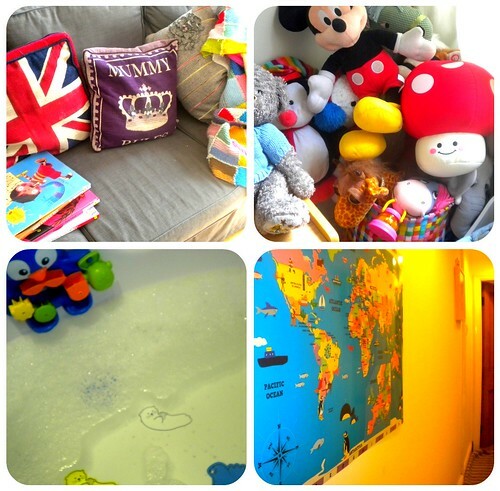 I love how children inject such colour into your home even if it's down to toys littering the living room floor or scribbled pictures on the fridge. I love my house again now. Hi - thanks for stopping by to say hello and so glad our lovely furries make you smile, they're a daft bunch. Your sons pic at the top is a corker.